I stayed in Afrodita which is another part of Afrodita II. From the outside they look almost the same. Afrodita II is newer so I think some chages might be added inside the hotel. We had breakfasts there and they were very good, although be prepared to eat the same things every day. It's plenty to choose from but it's always the same. But you can take as much as you want, staff add fresh products when they are finished. The rooms are accompanied with TV, fridge, cooker/microwave,air condition. They are cleaned every day. You get clean towels twice a week. 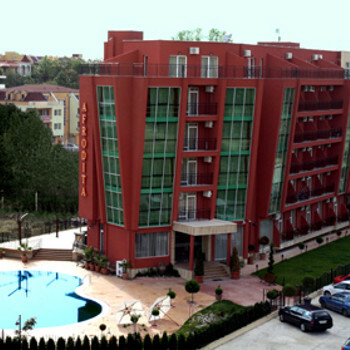 The hotel is about 15 minutes walk from the main centre of Sunny Beach. You can find a lot of restaurants and pubs closer to it as well. It's 5 minutes walk from the cheapest supermarket. And about 10 minutes walk from the beach. The staff is great. They're always smiling and do whatever they can to make your stay nice. The hotel itself doesn't offer any entertainment. There's swimming pool and a bar so you need to entertain yourself. I can definitely reccomend this place. i actually stayed in afrodite which is part of afrodita2 and is situated next to it.afrodita2 is much classier than afrodita which is very classy.rooms are lovely,food is ok location only 10min walk to bars and restaurants.staff very friendly and obliging.